Whether they’re seizing the spotlight on stage or on screen, today’s rising stars are fail-safe style muses. So if you’re in search of new fashion icons, we suggest watching this fab four for endless inspiration. Praise be, for Ofwarren would definitely approve of Madeline’s off-screen looks. The Handmaid’s Tale actress has been a regular on red carpets as of late, and her style is far from matronly. A fan of striking off-shoulder gowns pulled straight from the runway, and corseted trouser suits that offset her wavy auburn locks, Madeline goes for fashion-forward looks that take certain panache to pull off. We think she and Cate Blanchett should be BFFs. 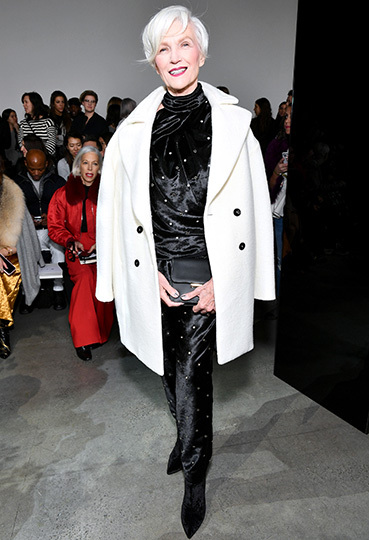 Model, multi-hyphenate and mother to a certain tech tycoon, Maye Musk is proof that style just gets better with age. The 70-year-old CoverGirl is a regular feature on runways, red carpets and best dressed lists, thanks in part to her signature silver bob and megawatt smile. It’s no wonder she coined #justgettingstarted. Eagle-eyed fashion lovers will recognise Kathryn as the cover girl of PORTER’s ‘Women in Hollywood’ issue, meaning the actress has graduated to fully fledged style muse. Whether she’s attending a press junket or on the red carpet, Kathryn’s style is feminine – think contrast-collar shirt dresses and jewel-embellished maxi dresses – without being saccharine. If you don’t know her name already, you’ll be heaing it a lot in the coming months.